(2/21/14) –Delivering petitions to MSNBC hosts. 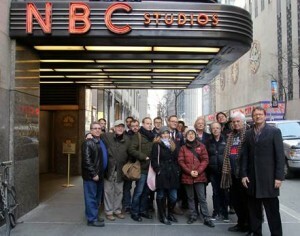 Workers at Comcast / NBCU owned Peacock Productions delivered more than 10,000 petition signatures to MSNBC’s primetime hosts today, urging them to speak out against the company’s anti-worker tactics. The five MSNBC anchors are Rachel Maddow, Lawrence O’Donnell, Al Sharpton, Ed Schultz and Chris Hayes. Please click here to send an email to the hosts, asking them to support Peacock workers. “MSNBC’s anchors are fearless advocates for our nation’s working-class families—night after night, they stand up to corporate greed, corruption, and wrongdoing. It is essential that they hear what people employed by the same corporation have to say about their own workplace struggles,” said Lowell Peterson, Executive Director of the Writers Guild of America, East (WGAE). The writer-producers at Peacock Productions, a subsidiary of Comcast/NBCU, have been trying to form a union for a more than a year with the WGAE. But the corporation’s lawyers have stalled the process, and management refuses to honor the employees’ votes. The writer-producers say Peacock’s parent company, Comcast /NBCUniversal, is trying to have it both ways–refusing to recognize their right to organize for basic protections, including minimum compensation rates, affordable health benefits, and paid time off, while at the same time, cashing in on MSNBC’s progressive programming. In 2012, the network’s writer-producers sought the help of WGAE. In October of that year, the union filed for an NLRB election. Comcast / NBCU lawyers claimed that half of the hard-working television professionals deserved no protection at all under the National Labor Relations Act and had no right to representation — a claim the NLRB rejected. In June 2013 a secret ballot election was held. But because of even more legal maneuvering by the company’s attorneys, those ballots are still sitting in a box, uncounted – fully a year and a half after the process began. WGAE says Comcast / NBCU’s flagrant abuse of the law will only get worse if it’s allowed to take over Time Warner Cable.